Ok. That’s not exactly true. I read the first three chapters of Emma once, and while I really did enjoy it – and while it wasn’t as trudgingly verbose as I had feared – I got sucked away by another book I was reading at the same time. And such and thusly, I…um… never finished. That said, I’ve seen practically every Jane Austen retelling I can get my hands on, and so when I infer that I’m “familiar” with the story and characters of Mansfield Park… what that really means is that I’m uncultured, I’m leery of actually reading classic literature, but mostly that I’ve seen three different movie versions of this novel. So do with that what you will. Why am I going on and on about Austen? Well, because The Trouble With Flirting is a young adult re-imagining of Austen’s Mansfield Park. And may I just say, LaZebnik has done it again? She’s done it again. I’ve read (and seen) my fair share of reimagined/updated/Austen-inspired stories, but hers are most certainly among my favorites. LaZebnik makes it feel effortless, never like she’s trying to hard to make the story fit the world and situation she’s created — never like it’s forced. It just… does fit. What’s more, she makes it a story all her own, and everything else just falls into place. BFFs4EVA? Everyone always makes a huge deal over the book boy, me included. You know what I’m talking about: Oh, he’s a bad boy with a heart of gold and a gooey, warm, tortured center. Dreamy, at least 6’2”, and his six pack has a six pack! But what about book besties? Why don’t we talk about them more? Those protagonists with whom you forge such a strong (albeit one-sided) connection, whose personality you totally mesh with? Those characters who, if they were able to leap off the page becoming more than the sum of their words, you’re certain you’d be the best of friends with? For me, Franny Pearson — reincarnation of Austen’s Fanny Brice — is such a character. Clever, projecting a quiet air of confidence, Franny’s an independent spirit with a good head on her shoulders. She’s not aggressive or particularly outspoken, but neither is she shy, or meek, or easily led. Perhaps she’s just so relatable because of how utterly normal she is and how instantly comfortable her character makes you feel, which is perhaps the cornerstone trait of Fanny Brice’s character? LaZebnik’s Franny, though confident, is not completely immune to those ever-familiar feelings of loneliness, the moments of uncertainty, the longing to just fit in. She’s a girl, slightly out-of-place, trying to tailor a place for herself in a patchwork world that sometimes doesn’t fit quite right… and of course this often means learning, growing and making mistakes. But the thing I love most about Franny is her voice. Full of heart and humor, at once a combination of verbosity and succinctity, her voice is wonderfully wry and distinctive. Franny is careful and selective with her words, and can recognize the wisdom of silence when warranted, or the value of subtlety. She’s just a wonderful narrator, and often left me laughing out loud…loudly. I may have mentioned this in my Epic Fail review too, but one of the things I appreciate about Jane Austen’s works in general, is the tongue-in-cheek observance of human nature, human folly, and general human ridiculousness and pretentiousness. Almost like a caricature at times, but without being cruel or outright satirical, and LaZebnik captures this essential quality of Austen’s works perfectly through Franny’s keenly observant eyes and her dry and unique sense of humor. See? Yeah. Franny’s just awesome. I will tell you that LaZebnik is brilliant, that this book didn’t play out as I expected, and that I was left with a big ‘ole goofy smile on my face at the end. AND, I will tell you that there were some aspects of the original story that always bugged me, but LaZebnik fixed them. Improved upon Austen? Isn’t that, like, bookish blasphemy? Perhaps, but in the perspective of this reader, it’s nonetheless true. The setting and circumstances of The Trouble With Flirting also appealed greatly to me. Capitalizing on the “staging a play” aspect of Mansfield Park and turning Franny’s environment into a high school theater workshop is just fantastic. Turning her into basically the “hired help” at this workshop is as equally inspired – a girl not as fortunate as her more wealthy peers who must work a summer job to save for college. Because of the strangeness of the 19th century British social hierarchy to our more modern sensibilities, it could prove challenging to update a story such as this one, but populating it with high school age characters in a high school-like microcosm that’s already defined by cliques – survival of the most-beautiful, most-charming, most-monied – with a definite social strata, it’s perfect. Overall. 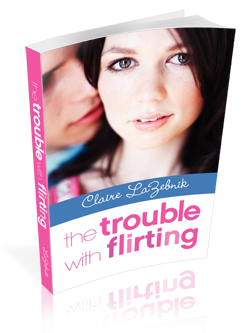 Claire Lazebnik’s The Trouble With Flirting is a cute, clever, and laugh-out-loud funny update of Jane Austen’s Mansfield Park with several extremely imaginative tweaks, an utterly lovable heroine, and a totally adorable romance. Oh I LOVED Epic Fail!! The characters were so relatable and flawed but real. I’ve read Jane Austen and I have to say it was a modern retelling that kept the spirit of the original alive while making it truly its own. I’m so glad this one is also well done!! I’m totally excited for the setting – very different, but still in the high school environment. Yes. Exactly. “Spirit of the original.” I think that’s what makes Claire’s retellings so good, she just GETS Austen and what she was trying to say. < – I say this given my awesome Austen credentials. lol I hope you enjoy this one. It is every bit as good as Epic Fail. Yay! I hope you enjoy it! It’s just so cute. If you’re looking for a fantastic, funny book to break up the more doom ‘n gloom/death ‘n impending disaster type books, this is the one you should have on your shelf. I haven’t read any Jane Austen novels! I’m glad I’m not alone. The name “Braverman” makes me think of the awesome TV show Parenthood–the family has that name. Great review, Dani! No! You’re not alone. lol And I haven’t seen that show, which is a bit of a mystery since I LOVED Lauren Graham from Gilmore Girls. I am a huge Jane Austen fan and have read all her novels. Mansfield Park is my second favorite so I love that there is a new modern retelling. It sounds fun. Thanks for sharing your thoughts. Jane Austen is my favorite author of all time – although I must admit that Mansfield Park is one of my least favorite Austen novels. I DO love modern retellings of Austen novels as well. I haven’t read this author before but I’m certainly going to pick up her books now! Thanks for such sharing such a keen review! I hope you enjoy it then. Especially with the tweaks. 😉 FYI – Claire’s other YA novel Epic Fail, which is a retelling of Pride & Prejudice, is as equally fantastic. LOL… it’s something I’ve always meant to do. Maybe I’ll finish Emma here at some point, maybe I’ll get the audiobook. Unabridged, no worries. 😉 I hope you enjoy TTwF as much as I did! YAY! Not too much longer ’til it’s out!